The Irish president has highlighted the importance of trade links between Britain and Ireland as he addressed a banquet at London's Guildhall. 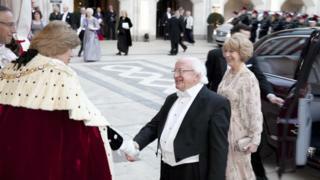 Michael D Higgins was speaking on the second day of his UK state visit. He said the two nations shared 1bn euros (£825m) in trade every week and he urged even greater economic co-operation between the UK and Ireland. He said the Republic of Ireland was "deeply grateful" for the UK's help during its recent financial crisis. As he arrived for the evening banquet, Mr Higgins was given a Guard of Honour reception outside the Guildhall, the ceremonial centre of the City of London. He told his audience: "The intertwined histories of Ireland and Britain have indeed known great turbulence, but we meet at a time when the relationship between us has never been more friendly or respectful." He added that the UK was currently Ireland's largest export market, and the Republic was the fifth largest export market for the UK. Mr Higgins thanked the UK for its recent financial assistance to the Republic of Ireland and said the Irish economy was now returning to growth and "winning back the trust of our people and of investors". The Irish government received a £3.25bn loan from the UK, shortly after it accepted an international bail-out from the European Union and International Monetary Fund (IMF). "In responding to our recent economic crisis, Ireland received significant support from our partners in Europe and, on a bilateral basis, from our friends here in the United Kingdom, for which we are deeply grateful" Mr Higgins said. The president said Irish exports were now "significantly higher than their pre-crisis peak". "Most importantly, we have gone from losing 1,600 jobs a week during the peak of the crisis to now creating 1,200 jobs a week," he added. The Guildhall banquet attended by about 700 guests, was hosted Lord Mayor of the City of London, Fiona Woolf. Earlier, Mr Higgins had a private lunch with Prime Minister David Cameron at 10 Downing Street and met Deputy Prime Minister Nick Clegg at Buckingham Palace. The president also met Mayor of London Boris Johnson at a youth leadership event London's City Hall. Mr Higgins addressed British and Irish teenagers at the workshop entitled Taking Charge of Change Together. Writing on his Twitter account, Mr Johnson said: "A joy to welcome Irish President Michael D Higgins to City Hall. Discovered we share a love of Horace and Aeschylus." Mr Higgins, the ninth Irish president, is a poet and academic as well as a former arts minister in the Dublin government. His day began at at Windsor Castle, where the president and his wife Sabina were met by the Duke of York, colonel-in-chief of the Royal Irish Regiment. They viewed the colours - regimental flags - of disbanded Irish regiments. The presidential couple looked over the colours of the Royal Irish Regiment, the Royal Dublin Fusiliers, the Connaught Rangers, the Prince of Wales' Leinster Regiment (Royal Canadians), and the Royal Munster Fusiliers. The regimental flags were given pride of place in a stairway entrance to Windsor Palace, so that everyone could see them, on the insistence of King George V in 1922. The colours, which honour the service of Irish soldiers in the First World War and other conflicts, have never been moved from their permanent setting - except when the 1992 Windsor fire threatened to destroy them. "Needs must, we took them out," the Duke of York told the couple. Mr Higgins' visit is the first state visit to the UK by an Irish head of state. Before lunch with Mr Cameron, Mr Higgins met Irish members of NHS staff at University College Hospital in London. It was one of a series of engagements highlighting how people from Ireland contribute to everyday British life. Speaking at a business breakfast in London Irish Prime Minister Enda Kenny described the state visit of President Higgins as "momentous". Mr Kenny welcomed the Queen's endorsement of the suggestion that a member of the British Royal family might attend some of Ireland's independence commemorations. He said the centenary events had to be handled sensitively but he would welcome any royal involvement. Mr Higgin's visit comes after the Queen became the first British monarch to visit the Republic of Ireland three years ago. Mr Kenny also said he would like to see the Queen pay another visit to Ireland but that was a decision for the British authorities.